In the first half of the 19th century Ralph Waldo Emerson was part of a small group of forward thinking Unitarian ministers who were ushering in an exciting wave of “new thought” that they later called Transcendentalism. In the end even the liberal thinking Unitarian Church was too constrictive for Emerson. He left the ministry only to emerge as one of the greatest spiritual figures ever produced by the United States. Over his lifetime he developed his own ideas and gathered an intellectual circle around him that is arguably the greatest collection of progressive thinkers ever assembled on American soil. Our ordinary experience of being human Emerson referred to as “What we commonly call man, the eating, drinking, planting, counting man…” He saw this as a misrepresentation of what we truly are – a misrepresentation that forces us to “live in succession, in division, in parts, in particles. Meantime within man is the soul of the whole; the wise silence; the universal beauty, to which every part and particle is equally related; the eternal ONE.” In our moments of divine revelation, intuition and insight we experience the direct knowing of the deeper “impersonal” soul of humanity. And in regards to this sense of self he taught that if “…(we) let it appear through (our) action, (it) would make our knees bend. When it breathes through (our) intellect, it is genius; when it breathes through (our) will, it is virtue; when it flows through (our) affection, it is love.” This recognition that human beings have two aspects of self anticipates a theme that is central to Andrew Cohen’s contemporary work today almost two centuries later. Assertions like these have lead some to mistakenly assume that Emerson’s teaching was nothing more than a rugged form of individualism or an extreme variety of self-assertion. In fact one of the main criticisms levied against Emerson was the charge that he was promoting a reckless form of self-aggrandizement and egotism. A broader reading of Emerson’s work reveals the deeper and more demanding nature of what he meant by self-reliance. The self that he was calling people to was “…the aboriginal Self, on which a universal reliance may be grounded.” This aboriginal self was the Over-Soul. Emerson’s teaching of Self-Reliance revolved around a shift in personal allegiance from the will of our more “common” sense of self to that of the Over-Soul. To Emerson the will of this deeper more transcendent Self was heard through the “involuntary” perceptions of intuition, instinct and deep spiritual revelation. These modes of knowing were not limited by the knowledge contained in our minds and memories and Emerson considered the truths that came from them to be self-evident needing no act of deduction to prove their validity. A similar fundamental shift in identity would later become a central feature of Evolutionary Enlightenment. Emersonian thinking has exerted a tremendous force on the shape and development of the American psyche. It acts like a strong and constant undercurrent in consciousness that reaches through time and pulls everything in its direction. Andrew Cohen, in spite of having little firsthand knowledge of Emerson’s work, could not have avoided its influence. Hardly more beautiful words have been spoken or truer! 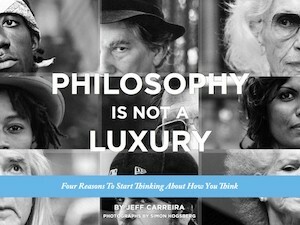 Philosophy is not a luxury. A flood put a foot of water in my house. Here’s my philosophy. 1. A flood is reality regardless of perception. 2. We had our house in order, but it’s temporary so don’t get too attached. 3. I can never repay all the people who came to help. They were amazing. But I can pay it forward. This absolutely rings true ….. If brain is the hard drive and mind is the soft, what comes up on the soft drive is sometimes something we can’t account for, out of nowhere and off the wall. At those spontaneous occurences, we can (should) decide whether they are relevant and something we want to attend or not, whether they’re something we feel worthy of ourselves. We may often simply accept random thoughts as our true nature carte blance but being more discriminating is maybe useful sometimes. Not to be dismissive, only more thoughtful. ??? Jeff, this blog is just beautiful! I used to regularly read poetry and philosophical essays, and I’m afraid I’ve let this practice fall by the wayside. Thank you for reminding me that this is indeed not a luxury, but an obligation as it keeps our minds supple and strong for the continual emergence and evolution of consciousness. Hi from Darwin in Australia’s Northern Territory. As we emerge from the shadow of nearly losing a decent government (after the horrors of John Howard’s 12 years of war on the poor and sycophanitc worship of Shrub), to progress under our first female prime minister in this sexist & racist & selfish white nation, we can only hope for Emerson’s type of inspiration to come forward here, under the influence of decent independents and Greens. Having just read Richardson’s great biography of Emerson, feel the need is even greater than ever for a more Transitional way of being together on earth. is there any movement in that general direction in the US? My own work is with people living with mental illness and/or intellectual disability – leading to the All Fruits Theory, akin to Queer Theory, see Robbie Lloyd All Fruits Theory on google.